streaming video and TV channels. 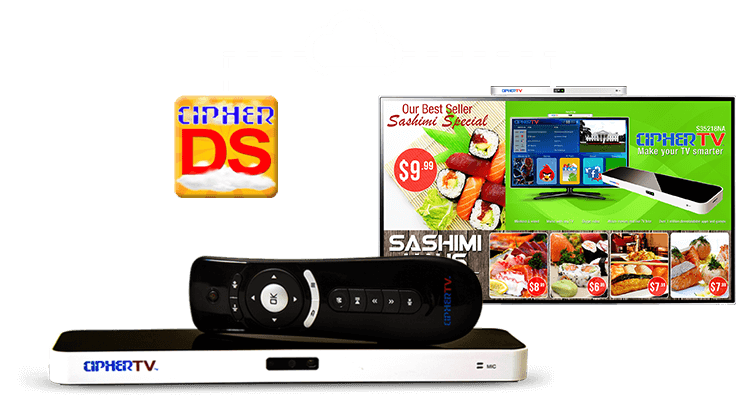 Plugin the CipherDS to an existing TV, digital monitor or projector with HDMI or RCA cables to instantly transform it into a digital signage terminal. The CipherDS’s powerful graphics processor provides crisp resolution for all screen sizes and is compatible with touch screen displays. 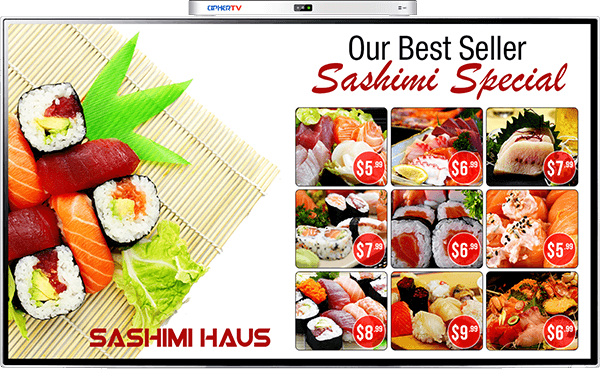 Create your digital signage account online and get started quick and easy. Speak to your customers with dynamic, in-store promotions and watch how customers become proactively engaged. CipherDS helps you capture your in-store customers attention and promotes buying behavior through enticing information. Regardless of whether you’re running a clothing shop, a quick-service restaurant or another kind of organization – your business is persuading someone to do something, and to do it now. 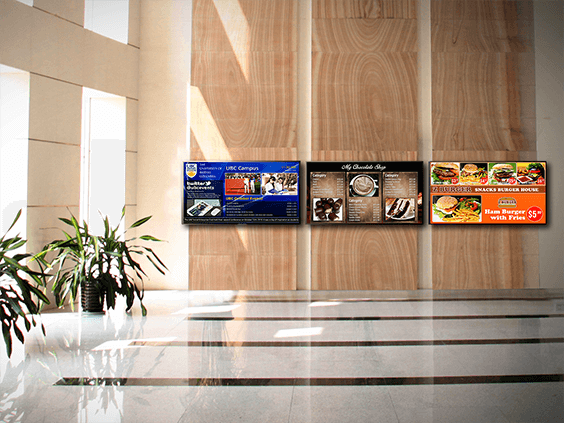 Digital signage is a powerful motivator and driver of increased sales and it leaves old-fashioned, printed signage far behind. Seizing the opportunity to draw more foot traffic and boost their brands, more retailers are using digital signage to replace outdated, static marketing campaigns. CipherDS can improve the experience of your visitors and client and take the burden of your staff. By using simple and effective design and helpful content that can promotes your services, products and also your business brand. Enterprise businesses and healthcare institutions share a remarkable number of similarities despite their obvious differences. While businesses are focused on selling a widget or marketing a service, healthcare institutions provide the service of delivering care. To that end, digital signage can benefit a healthcare institution in a multitude of ways. Customers want more from businesses than just an item of clothing or similar goods. They want to form a relationship with the place they are buying from. Informing customers about your business and services, and the people who help it to function, can build affinity and form lasting relationships. Include testimonials, success stories, and reviews. Access our online management system anytime to create or change content in real-time. Manage multiple screens and locations with the same content, or create unique messaging for each individual digital sign.